Whether you want to be able to run out the door faster when you’re getting ready for work in the morning or you’re just tired of having to lace up your sneakers on the way out the door, there’s a way you can use your time getting ready just a little more efficiently. That’s by learning how to lace your shoes so they’ll slip on. While these shoe lacing techniques work best with shoes that are slightly more loose-fitting than with a pair of running shoes, learning how to do them can save you a little bit of time and frustration every day, and that bit of time can often make a difference when you’re in a hurry. The first way that you can lace up your shoes so that they can easily slip on is to army lace them. While army lacing will look somewhat like a standard way of tying your shoes, you’ll actually be ensuring that there is a bit more flexibility in the lacing so that you can slip your shoes on and off with ease. Start by pulling each end of the shoelace through the lowest eyelet on the shoe. Feed it so that the tips of the shoelaces come out of the holes and are outside of the shoes. Take the shoelace (A) on the left side. Put the tip into the left eyelet that is directly above the eyelet that the shoelace tip just came out of. Repeat this same thing on the right side shoelace (B), putting the tip into the second eyelet right above where the shoelace came out. Then, take the right side shoelace (B) and cross it over to the left side of the shoe. Bring it up through the next eyelet on the left side so that the tip is outside of the shoe. Now, take shoelace (B) and put it straight down through the next eyelet on the left side, essentially repeating what you did in step 2. Then, take shoelace (A), cross it up through the next eyelet on the right side, and then directly down through the eyelet straight above that one. Repeat this process over and over again. The pattern is to go straight out through an eyelet, straight down through the next eyelet above that one, and then to cross diagonally to the other side to repeat the process. Repeat these steps until the entire shoe is laced up. That’s it. You’ve army laced your shoes! So, what is it about this type of lacing that makes it easier to slip on your shoes? 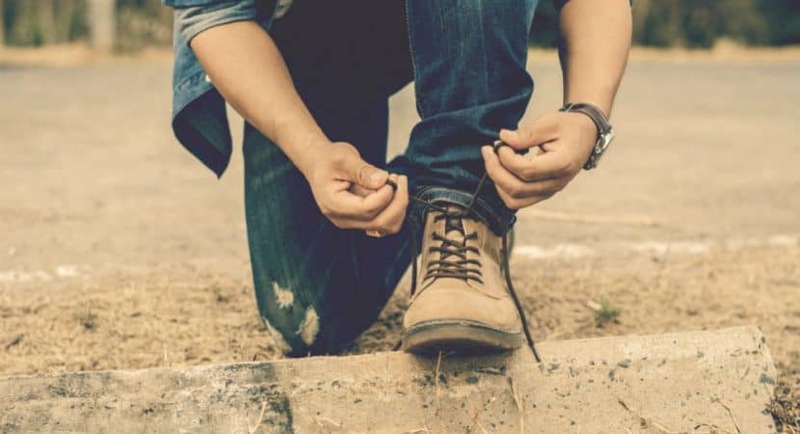 When you lace your shoes up this way, the shoelaces cross on the inside rather than the outside, and there is a bit more room for slack in the way that the shoe can stretch because of it. Sliding on your shoe becomes easier because of this extra space in the shoe, so you can slide on your shoe and go in next-to-no-time at all! This type of lacing is best for thick leather boots that do not flex very easily, but you can try this lacing out on any type of shoes that you want to be able to put on quickly! If you want to lace dress shoes or a similar pair of flat shoes so that they can be slipped on easily when you’re getting ready, you might want to try the more professional and clean-looking straight bar lacing technique instead. This type of lacing looks excellent and is easy to do. Plus, your foot will slide right in! Start by putting the shoelace through the first two eyelets. Put the shoelace through the holes so that the tips are inside of the shoe, and they are even in length. Take shoelace tip (A) on the left side. On the inside of the shoe, bring the lace up and through the eyelet directly above the first eyelet. Bring shoelace tip (A) across the shoe, making sure that it is not twisted. Then, put it down through the second eyelet on the right side of the shoe, which is right above the free shoelace (B). Take shoelace (B) and go under and up through the next unoccupied eyelet on the shoe, bringing the shoelace to the outside of the shoe by going through the eyelet. Then, cross shoelace (B) across the shoe and go down through the parallel eyelet. Repeat this process, switching shoelaces each time, until you are finished. When you get to the end, you will find that your shoelaces are on opposite sides if you are lacing dress shoes. You can then make a neat bow to finish the look. That’s all it takes to straight bar lace your dress shoes! Now you can try out a few more styles of lacing up dress shoes! As you can see, it doesn’t have to be difficult to lace leather dress shoes in a way that you can easily slip your shoe on and off without any trouble. Lace Up! Once and for All! Once you learn how to lace shoes so they slip on, you can save yourself a bit of time and frustration every day. Sure, lacing shoes does not take that long to do, but it can be just long enough to slow you down when you really want to run out the door. Besides saving time, it can be nice not to have to go through the issue of lacing every day. With these tips, you’re able to make your life just a little bit simpler. At the end, who doesn’t want that kind of convenience?